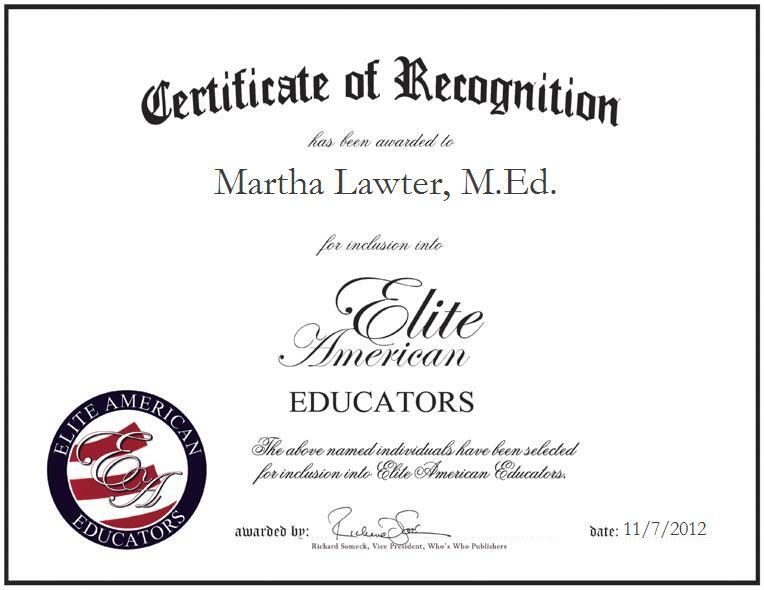 WICHITA, KS, November 7, 2012, Martha Lawter, M.Ed., Second-Grade Teacher at Jackson Elementary, a subsidiary of USD 259, Wichita Public Schools, has been recognized by Elite American Educators for dedication, achievements, and leadership in elementary education. An award-winning professional, Ms. Lawter dedicates herself to helping the people in her community to accomplish their goals, and to shine like the bright stars that she believes that they truly are. She has established herself as an expert on the foundation of winning relationships with young students, and as an elementary school teacher, Ms. Lawter teaches all subjects to her second-grade students. She is in charge of creating lesson plans, grading students’ work, evaluating their learning, and participating in parent conferences. Ms. Lawter has been a professional educator now for almost 30 years. She always knew that she wanted to become a teacher, ever since she was a little girl. She was inspired by the work put forth by her grandparents, both of whom were teachers. Ms. Lawter started her career as a sixth-grade teacher in Alma, Kansas, where she was also the coach for some of the girls’ teams. She then went on to become a fifth grade teacher at Wilson Elementary, and stayed there for ten years. Later, Ms. Lawter left teaching for nine years to stay at home with her children. She returned to teaching and taught kindergarten for 15 years at Jefferson Elementary.